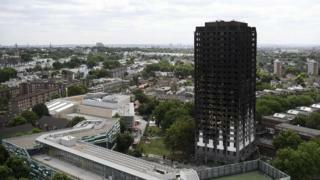 Britain's equality watchdog is to launch its own inquiry into the Grenfell Tower fire. The Equality and Human Rights Commission (EHRC) told the Observer it would look at whether the authorities failed in their duty to protect life. This aspect, it said, was "currently overlooked". Meanwhile, the leader of the council that owns the tower told the Sunday Times she would not attend a memorial service, after a request from families. Elizabeth Campbell, who took over at Royal Borough of Kensington and Chelsea (RBKC) in the wake of the blaze, said the memorial service on Thursday marking six months since the disaster was not "about me". The government appointed a retired judge to lead an inquiry into the 14 June blaze, which killed 71 people. The EHRC's work will focus on whether the government and RBKC fell short in their duty to protect life, prevent inhuman treatment and provide safe housing. Commission chairman David Isaac said the EHRC's inquiry would look at the human rights and equalities perspective - something it feels is "missing from the official inquiry". He added: "Grenfell for most people in this country, particularly in the way the government has reacted, is a pretty defining moment in terms of how inequality is perceived." Sir Martin Moore-Bick, the retired Court of Appeal judge leading the official inquiry, was criticised for omitting issues such as social housing policy from his terms of reference. Mr Isaac said the watchdog's inquiry, full details of which will be published on Monday, would complement Sir Martin's findings. A spokesperson for Sir Martin's inquiry said the probe had been "set up to determine exactly what happened on 14 June, why it's happened and what can be done to prevent a similar tragedy. "We welcome any evidence the commission can provide that is relevant to the matters covered by our terms of reference."